Kramskoy – Russian artist, master of genre and historical painting, portrait painter, art critic, a man of sharp mind and great talents. It was he who once headed the “riot of fourteen,” when the Academy of Arts held a big competition for the best painter. The winner would receive a gold medal and full board in Spain, but the Council reserved the right to determine the topic for students. So all the participants of the “riot of fourteen” got the theme “Feast in Valhalla”, which did not deceive any of them. At first they filed a petition for change, then, when the request was not satisfied, they left the walls of the Academy and left for free navigation. This desire for freedom comes through in all the paintings of the artist, not only genre or historical, but even in simple landscapes. The Forest Path is no exception. 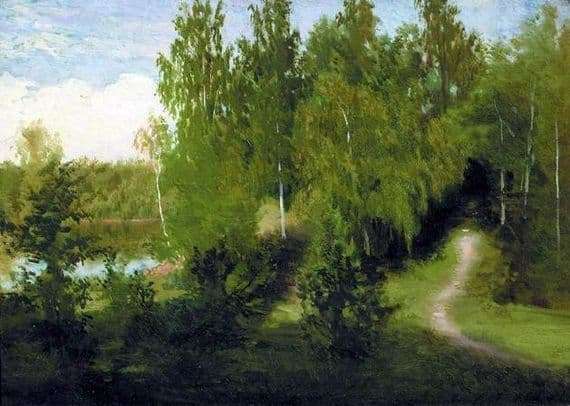 With light brush strokes, he seems to be drawing a path along which one can get away from the noisy, sultry world to the natural world, quiet and full of peace. The picture shows a forest stream reflecting the lazy movement of the clouds. Trees are whispering in leaves and reaching for the sky, as if wanting to tickle it. And in the thicket of the forest a narrow path runs away, heated by the summer sun, and is lost in the thick darkness. The contrast of the gold-drenched forest with darkness in the shadow of distant trees is striking – the path as if leads to the underground kingdom. However, there, in the wet twilight, there is also its freedom – the freedom to know that no one is looking at you and not trying to judge you, the freedom to fry mushrooms and pick berries, instead of working and losing power on someone else. The path beckons, calls and attracts. Even just looking at the picture, I want to enter the canvas, step on the warm forest land, and go where my eyes are looking, under a sky full of clouds, in a world written with a light brush and as if glowing from the inside.